Foam board signs are perfect for directing your customers and/or employees in your organization. Use them at trade shows or presentations, as they look professional and impressive at the same time. Our foam board signs printed on lightweight 3/16” (5mm) foam board/foam core, which makes them easy to transport, lean against the wall or hang. Perfect for internal signage or use them as a decorative piece around your office. 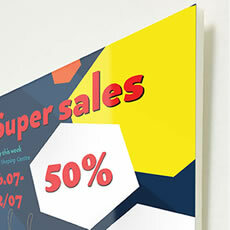 If you own a retail store – then these signs are perfect for advertising any promos or specials. Please note that this product is for inside use only and has a signage quality print (not art print). It is useless to say that your signs are as good as their design. In order to attract the attention of your prospective buyers, your sign design should stand out. Let our creative design team put together an outstanding design for your product. If you have questions about foam board signs, turnaround times, pricing and finishing options, please do not hesitate to contact us, as we are always happy to assist you over the phone, via email or in person.